Many of you will be familiar with Aurelia Mitela, the elder stateswoman of INCEPTIO, PERFIDITAS and SUCCESSIO and the heroine in her own trilogy set in her younger days – AURELIA, INSURRECTIO and RETALIO. Although an honourable name in Roma Nova, it was one with a long history in the Roman past. 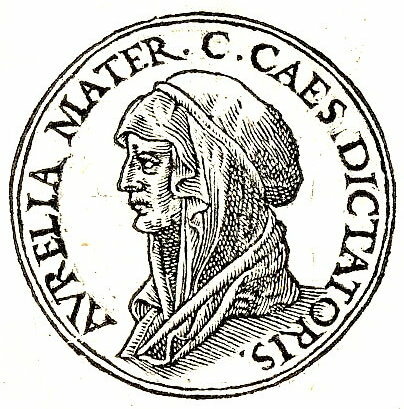 One of the most famous was Aurelia Cotta, the mother of Julius Caesar. Born in 120 BC, she came from a top drawer family with consuls, senators and generals in every generation in her distinguished family tree. Her father was consul in 119 BC and her paternal grandfather in 144 BC. Ditto three of her bothers: Gaius Aurelius Cotta in 75 BC, Marcus Aurelius Cotta in 74 BC and Lucius Aurelius Cotta in 65 BC. – Gaius Julius Caesar (100 – 44 BC), the dictator. Caesar senior’s progress through the cursus honorum, the Roman career path, is recorded although the specific dates are a bit wobbly. According to two elogia erected in Rome long after his death, Caesar senior was at some time commissioner in the colony at Cercina, military tribune, quaestor, praetor and proconsul of Asia. He died suddenly in 85 BC, in Rome, while putting on his shoes one morning. (Dangerous things, shoes). His father, who had had him educated by Marcus Antonius Gnipho, one of the best orators in Rome, left Caesar senior the bulk of his estate, but after Marius’s faction had been defeated in the civil war of the 80s BC, this inheritance was confiscated by the dictator Sulla. This is probably why young Julius Caesar was always strapped for cash. That’s the official stuff, but what was Aurelia like? The historian Tacitus considered her an ideal Roman matron and thought highly of her (Dialogus de oratoribus, section xxviii). Plutarch described her as a “strict and respectable” woman (Plutarch’s Lives: Caesar). Highly intelligent, independent and renowned for her beauty and common sense, Aurelia was held in high regard throughout Rome. Caesar senior was often away so the task of raising their son fell mostly on Aurelia and her influential family’s shoulders. They lived in the Subura, a working class district in Rome, unusual for a patrician family. When the young Julius Caesar was about eighteen, he was ordered by the then dictator of Rome, Lucius Cornelius Sulla, to divorce his young wife Cornelia Cinna, Cinna’s daughter. Young Caesar firmly refused and put himself at risk of execution by Sulla who was not exactly unknown for knocking off anybody who displeased or opposed him. 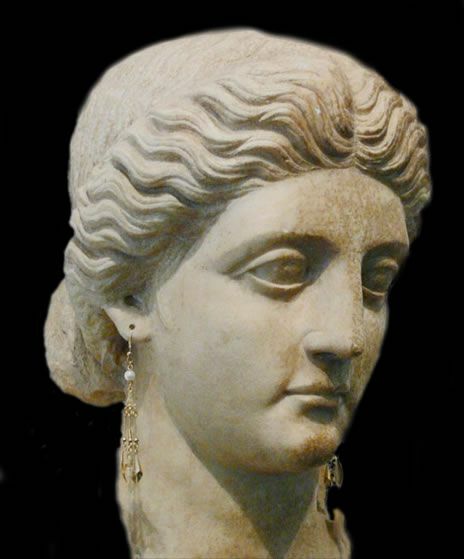 Aurelia headed a petition to Sulla that succeeded in saving her son’s life. After Cornelia Cinna’s death in childbirth, Aurelia raised her young granddaughter Julia in her stead and presided over her son’s household. Young Caesar subsequently married Pompeia Sulla. During the Bona Dea festival held at young Julius Caesar’s house, Aurelia’s maid discovered Publius Clodius disguised as a woman, ostensibly in order to start or continue an affair with her second daughter-in-law Pompeia. Although young Julius Caesar himself admitted Pompeia’s possible innocence, he divorced her shortly afterwards stating that his wife must be above suspicion. Not much more is known about Aurelia. She must have had a rather conventional though formidable personality. In her Masters of Rome series, Colleen McCullough breathes life into her as a young landlady of a large insula, as one who has to become mother and father of her children during her husband’s long absences, and later on through a rather murky but basically platonic relationship with Sulla. Did Aurelia have the first C-Section? Speculation that young Julius Caesar was born by Caesarian section doesn’t seem to be true. Although Caesarean sections were performed in Roman times, no classical source records a mother surviving such a delivery. The term has may have derived from the verb caedere, to cut, with children delivered this way referred to as caesones. Pliny the Elder refers to a certain Julius Caesar (an ancestor of the our Julius Caesar) as ab utero caeso, ‘cut from the womb’, giving this as an explanation for the cognomen ‘Caesar’ which was then carried by his descendants. Can you imagine it, with no anaesthetic or antibiotics? I think we’ll leave it in the realm of folklore. As for Aurelia Cotta, she died around 54 BC at the respectable age of 65, so I think we can safely say she wasn’t the mother of the C-section. Delighted you enjoyed it, Pamela. Thank you very much for your very interesting post. It was intriguing to research – she’s such a cypher. It’s a pity that so little is known about such a important woman. But thank you for stopping by and commenting.